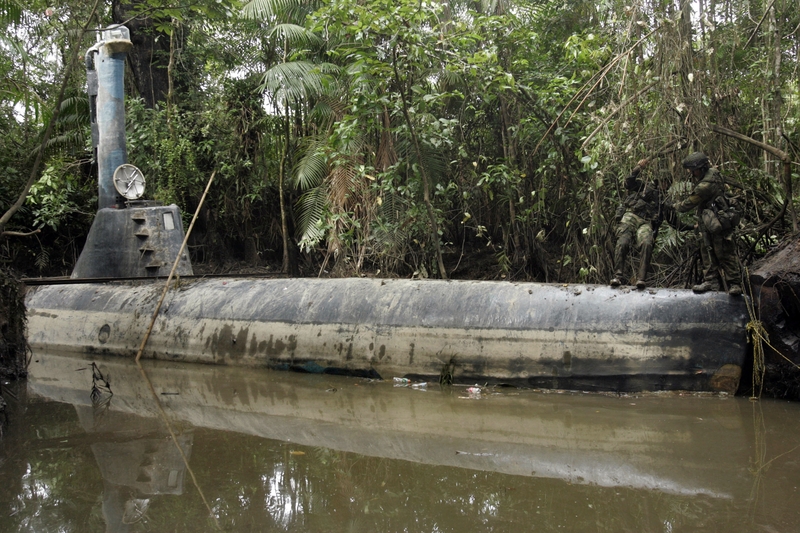 It’s Pablo Escobar meets John Holland: drug lords built a 99-foot-long submarine, believed to be the first Colombian narco-sub capable of traveling fully submerged, Colombian officials said Monday. It even sported a periscope. The fiberglass sub, crewed by four, had been designed to haul up to eight tons of narcotics and could travel 9 feet underwater, powered by two diesel engines, Colombian officials told the Associated Press. Tipped off to its existence, the Colombian military seized the sub from its makeshift berth on a jungle river, hundreds of miles off the country’s northwest coast. No one was aboard, however. Col. Manuel Hurtado, chief of staff of Colombia’s Pacific Command, estimated the sub, outfitted with a 16-foot periscope and air conditioning, had cost $2 million to build and said it could make the roughly 1,300-mile trip to Mexico underwater. “The engines were already fully installed and ready to go,” he said.